Awesome news! I will be hosting a monthly movie night at Hiding Gallery. For the inaugural night of Moving Pictures, we will be showing Martin Scorcese’s classic 1985 black comedy film After Hours! 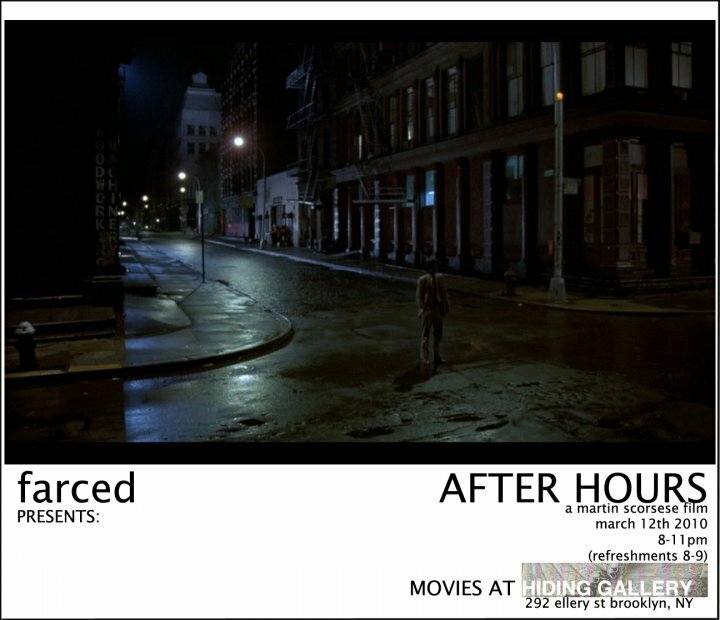 After Hours depicts a New Yorker, white collar worker Paul Hackett (Griffin Dunne), who experiences a hellish and seemingly endless night on the seedy streets of New York’s SoHo village. Broke, frenzied and at his rope’s end he is thrust into the increasingly upsetting and often outlandish lives of a variety of ensemble characters. A sequence of misfortunes, coupled with misunderstandings and tragedies threaten Paul’s safety and sanity while he attempts to get back to his apartment, uptown. It’s an excellent film, as I am sure most of you reading know. We will be serving veggie sloppy joes, home made fries and other diner affiliated goodies to accompany the reoccurring diner scenes in the film from 8-9PM. The movie starts at 9PM. If any readers would like to come, please shoot me an email to aid in figuring out how much food to make. Included with this entry is Peggy Lee’s 1969 single “Is That All That There Is?” from the film’s soundtrack and climactic scene. I am pretty excited about this and other stuff lined up! More info could be found on Hiding Gallery’s blog.